Dr. Amir Ahmadi’s main emphasis is on comprehensive dental reconstruction and aesthetic dentistry. His practice philosophy emphasizes an individual approach to dental treatment and patient care. He empowers his patients to better their lives by obtaining oral health and function and aesthetics. Dr. Ahmadi is a graduate of the University of California, San Diego and a graduate of New York University College of Dentistry. 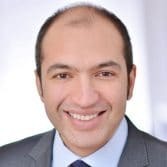 Dr. Ahmadi has advanced surgical training from the New York University Department of Periodontology and Implant Dentistry, and is board certified. Dr. Ahmadi enjoys raising his 8-year-old son Rik, sports, hobbies, history, self-improvement, and of course dentistry.